Thanks to Nipun's Vietnam blog, it led me to Giang's Awakin Circle in HoiAn while visiting my granddaughters in Hong Kong. Giang's kindness invited us in her home. 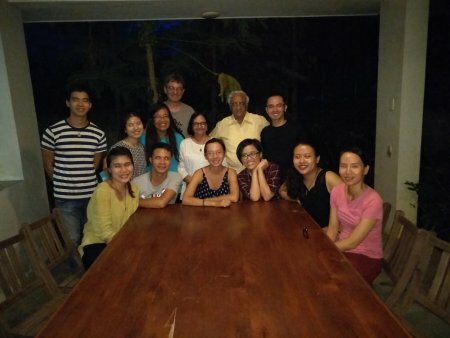 Meditating with many youngsters in the circular room of Giang's riverside home was an unforgettable experience for me and Radha during our 12 days visit to Vietnam. The vegan dinner was not only delicious but simply blended with love and affection. My reflections: Love is a soul to soul inner-net connection -- nothing physical or mere emotional about it. It conveys the pure, positive and powerful intention that we all are the manifestation of same life force. It replaces narrow-mindedness with an inclusive broad consciousness vibrating in the living Universe. As Kabir said, "Hum sub Mai, Sab hai hum Mai" -- We are all Divine, in everyone is Divine.